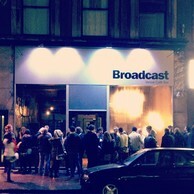 The spiritual offspring of the Captain’s Rest, Broadcast is a bar, cafe and venue on Sauchiehall Street. Hearts were broken when The Rest suddenly shut its doors in the summer of 2012, and it’s not hard to understand why. On top of providing crucial hangover relief for the Woodlands community in the form of cheap burgers and pizzas, it was an extremely decent venue, splitting half its monthly line-ups between PCL and independent promoters. Broadcast attempts to fill that void without depending too much on those halcyon days. PCL’s new stomping ground is a considerably more spacious affair; a large basement accessed via a positively deadly spiral staircase. Upstairs is a real change of scene, composed of high ceilings, dark corners, and largely unadorned stonework. Essentially, Broadcast pulls off the feel of a winter night refuge more commonly associated with cosy old man pubs, but without the dogs and smell of wax jackets. A welcome addition to the scene.